I recently attended a special event to celebrate fathers in Fairfax County, Virginia. Between being a dad myself, working at National Fatherhood Initiative, being a volunteer, and then seeing my local government care about fathers, I found the event inspiring on many levels. With Father's Day fast-approaching, I wanted to highlight this inspiring event and the county leaders who care about connecting fathers to their families enough to celebrate it. As you read this post, consider: How are your elected officials celebrating fathers? What if all counties celebrated fathers like this? To celebrate fathers, The Fairfax County Board of Supervisors declared June as Fatherhood Awareness Month in a special ceremony. in Fairfax County to raise public awareness of the importance of fatherhood and the importance of father's engagement with his children and family. 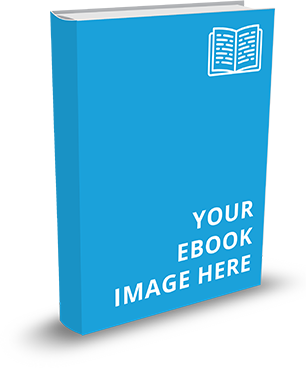 Watch the video and see Moses Cobb, a graduate of the 24/7 Dad® Program back in 2012 as he explains, "I realized fairly quickly after my son Bryce was born that a father is not given instructions for raising their children. Even though the instructions for the hosptial bill were very clear." Moses continues, "The Dad's Parenting class allowed for very thought-provoking discussions and debates where I was challenged not only by the instructors but by the other dads in the class as well." "We learned why it is so important to not only by physically present but mentally engaged with our sons and daughters," says Moses about what he learned while attending the fatherhood program. Watch closely and you will see that Moses and his message receive a standing ovation from the audience. I am proud to say I was one of the people standing and clapping along with the rest of the audience that morning. Fairfax County Supervisor Catherine Hudgins, Hunter Mill District, North County, brought the Fairfax County Department of Family Services, Children, Youth, and Families Division (DFS-CYF) request forward to the Board of Supervisors (BOS). Sharon Bulova, Chairman of the Board of Supervisors. Nannette M. Bowler, Director of the Department of Family Services (DFS). There are several additional volunteer facilitators who help serve dads in Fairfax County. When the executive leadership of a county celebrates fathers, more fathers will ultimately connect with their families. 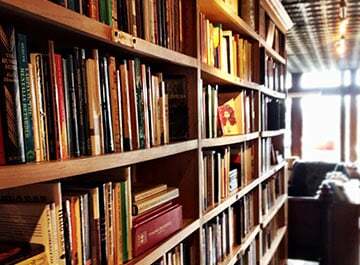 This will directly impact the children in a community. I love what John C. Cook, Supervisor, Braddock District, said at the ceremony, "Fathers are critical to our families and families are critical to our society." 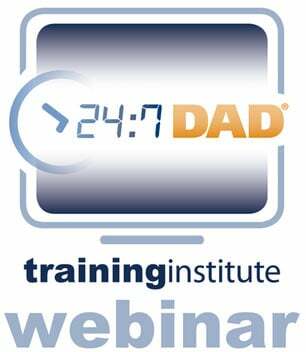 Fairfax County uses 24/7 Dad® for their fatherhood program. 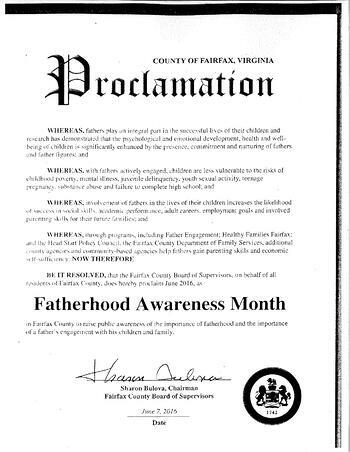 I hope other counties will be like Fairfax County, and show the importantance of fathers. What is your county doing to show that fathers are important?